This joy of a Scottish book was published in 1947. I found a first edition without the dust jacket online. Katrina @ Pining for the West mentioned picking up a McFlannel book at a sale and that sent me on a lookout for this set of books with a unique name. 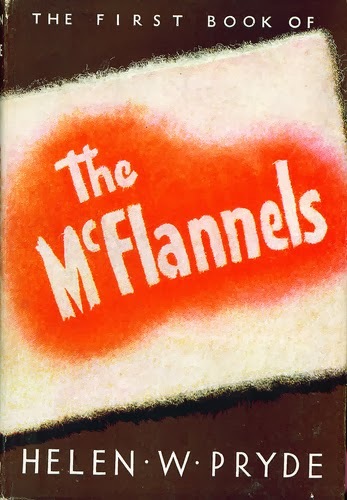 Before the books The McFlannels started out in 1939 as a radio soap opera on the BBC. Known as Scotland’s Happy Soap! The first book came out in ’47 and a subsequent book each year after. In 1958 it became a TV series. The First Book of the McFlannels begins in 1914 and introduces us to Willie McFlannel and his girl Sarah McTwill and ends in 1939 with their 25th anniversary celebration. They marry and settle down in a flat, a room and a kitchen. Willie is a fitter in the Clyde Shipyard. After 4 children are born they move up to a tenement, 2 rooms, a kitchen and space on the stairs. A special little dog they name Lassie comes along when they move into the tenement and the story of how she comes to them is very funny! After Willie gets a promotion to foreman he gives in to Sarah’s need to ‘move on up’ and they move to a Corporation house, 4 rooms and a kitchen with a yard and garden. Sarah wants so badly to be above her ‘station’ in life and is very funny and poor old Willie is happy to just be and is so kind and loving with Sarah and need to be ‘more’. The four McFlannel children are Polly, Matt, Peter and Maisie. Polly much to her mother’s disappointment refuses to go on to a higher education although she is very smart. She gets a job with the Sheriff’s Office and makes her mom proud! Sarah is determined Matt will be a teacher, a very respectable job, but he hates school and has his nose in a silly book all the time. He wants to be a writer. Peter becomes an engineer and finally in Maisie, Sarah gets her teacher. All the wonderful neighbors in their tenement and characters in their life are all named from different fabrics, McTweed, McCotton, McLeather, McRubber, McCamel Hair, McPlush, McVelvet. Their type of fabric gives you a clue to the way yare, McFlannel, warm and comfortable, McCotton well, cotton is just cotton nothing special! McTweed, scratchy and irritating. It’s hilarious! Just a joy to read. I’m definitely going to collect the other four books in the series. Thanks Katrina for pointing me to them!